Hello, readers ! It has been too long! As so many people say, I didn’t mean to take such a long holiday break…but I did. The good news is I have lots of books to share about in the upcoming months and a new look to reveal on the blog soon (as in, the blog is getting a new look…not the blogger, unfortunately). Today, let’s talk about some fun books my kids are into. Um, how has this book escaped my attention my whole life? It’s written by none other than Munro Leaf, the author of Ferdinand, and illustrated by…drumroll please…Ludwig Bemelmans (yes, the creator of Madeline). Talk about a dynamic duo. 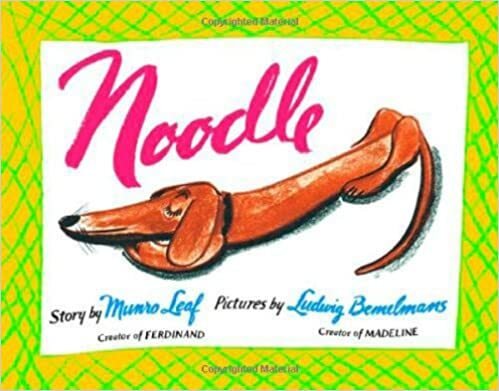 It’s a warm and fun, somewhat offbeat, story about a Daschund named Noodle who is given the opportunity to change his shape into whatever he’d like. He looks long and hard for a new shape, but no one seems to understand what he wants a new shape for: to dig better holes. Obviously, this hasn’t made the classics list of children’s books despite its author/illustrator combo, so lower your expectations a bit from the greatness of The Story of Ferdinand, but it is still well worth reading and enjoying. 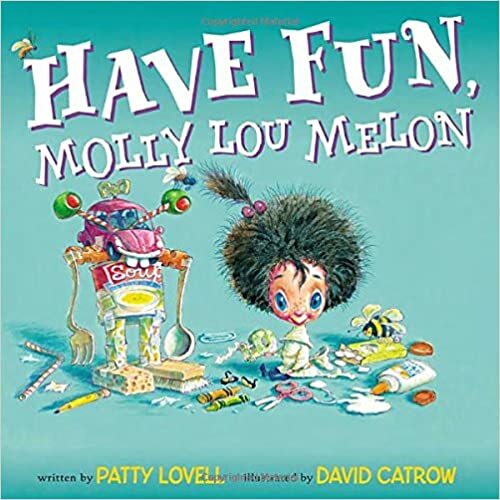 Molly Lou Melon is a tiny girl with a cheerful determination to have fun her grandmother’s way. When her grandmother says classic grandmotherly things like, “When we were your age, we didn’t have TV; we watched the clouds,” Molly Lou Melon does, too. She takes all her grandma’s recommendations to the furthest degree and brings a friend along on the old-fashioned fun way. The illustrations are really what make the book. 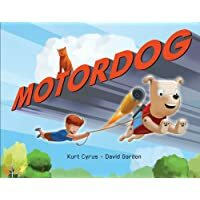 A bit outlandish and Dr. Seuss-ly, they are the kind that strike you as simple until your five-year-old-son says, “Look at how this cloud looks like…” and then you realize this book is so perfect for children. We were introduced to it on Christmas by an aunt with great book taste, and promptly found its companion, Stand Tall, Molly Lou Melon at the library the next week. We highly recommend both! Five-year-old Isaac picked this library find out and I have since read about a million times. A little boy orders a robot dog off the internet (by himself! what in the world), and finds it too be way too fancy after a near death experience involving a helicopter back pack. Yes, it’s pretty obvious why a little boy would think this book is the best. It’s one of those books I include on my lists because of the vast love my children have for it, not due to any fondness I have for it. Sometimes, whatever books get your children glued to reading is whatever you’ll read (within reason). Seven-year-old Ella is currently devouring this early reader series. She can make it through one book in a day or two. 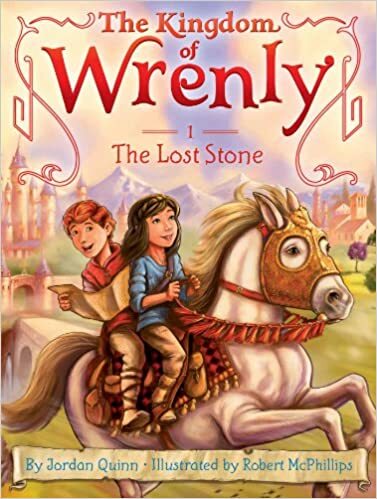 Featuring a prince named Lucas and his best friend Clare, and set in a medieval make-believe world, the books are full of adventures with dragons, giants, and other page-turning fun. I read through the first one, but can’t keep up with Ella’s pace! These books remind me of the TV series Sofia The First in their content and setting, but are definitely geared more evenly to both boys and girls. Thanks to www.maybematilda.com for the recommendation! Yes, we’re still reading lots of fairy books here. Our latest favorite is one of the earliest in the Disney Fairy expansion. I continue to be impressed with the quality of these fairy books, and shake off any book snobishness when it comes to Tink and her pals. 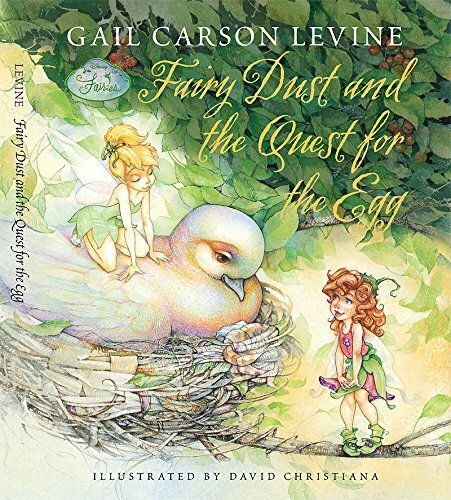 Gail Carson Levine is the author of this particular book (famed for Ella Enchanted), but it’s written for a younger audience than her other books and features many adorable illustrations of little-girlish fairies. That’s about it from us this week! What great books for kids have you found? Thanks for joining us for Three Book Thursday! This blog feature is all about our favorite children’s books of the week, and celebrating those moments when we can say, ‘Yes, we’ll read just one more book.’ See all the posts in the category here. And check out our other series about children’s book’s, Friday Favorites, here.